consisted of Batman Begins (2005), The Dark Knight (2008), & The Dark Knight Rises (2012). It is by-far the most realistic take on any superhero. Batman series challenges the fact that superheroes are not unrealistic, that anyone can be a superhero, that a superhero may not be a fan favorite and superhero figures do not have to die with the person who plays them. It also shows that villains are not after power or money. For them, it may be of much more importance. Christopher Nolan has been able to produce the dynamite of a series, which is to be remembered forever. who trains him as a fighter to accomplish his goal and to be strong, externally and internally. He then asks Bruce to return the favor by joining the League of Shadows, headed by Ra’s Al Ghoul, an organisation which, “every time a civilization reaches the pinnacle of its decadence, (we) return to restore the balance”. He refuses, since Gotham was their next target, something he wanted to stand against since the very beginning of their training. He burns the place down, rescuing his trainer. He returns to Gotham, understanding that the situation has gone from bad to worse and that now, he had to become a ‘symbol’. He had had his share of incidents with bats in the south-east corner of his residence, the bat went on to become his symbol. He also comes in contact with a “good cop”, Jim Gordon. Dr. Crane is revealed to be a lawyer who helps out the mob dealers who are caught, to not be captured in jail, but makes them transfer into the Arkham asylum. Falcone, the mob leader, has in his control, Crane and hence, the entire system. Will A figure like Batman be able to deal with the issue is the first question. Jim Gordon: We start carrying semiautomatic, they buy automatic. We start wearing Kevlar, they buy armor-piercing rounds. This is where Batman Begins ended. The Dark Knight begins with a robbery scene executed by a bunch of clown-like gang, ending up to be killed by the joker himself. Batman by this time has become a hero for the civilians. A series of captures by Batman, prosecution and legal capture by his trusted friend, Lt. Gordon and trials against his caught criminals by Harvey Dent, the love interest of Rachel, frightens the miniature remaining mob dealers of the city, who, “out of desperation, have to turn to a man they don’t properly understand” i.e. the Joker. The Joker inducts a series of kills, indicating his next target turn by turn. The way he plays with the minds of everyone, especially the Batman, terrifies everyone. He is interested in capturing and knowing who the real Batman is. One after the other, he kills important people, and the way he kills them reveals the weak point of Gotham i.e. corruption. The mayor is also named as a target, but is saved by Gordon, who faces the bullet and dies. At a press conference where the real Batman was supposed to be revealed out of pressure from the Joker, Harvey attracts all attention to himself, stating himself as the real Batman, instead of Bruce Wayne. What will the Joker do next? Will he be stopped, or will his mind games cause Bruce and Harvey the fight for Gotham? These questions build the plot of the story, and are too interesting for me to reveal. It’s been 8 years since the Batman has showed up. The streets have been cleared, due to the Dent Act. But, the League of Shadows is still running under Bane. And Selena Kyle, who wears similar costume to Batman, is a criminal who wants to use a device which can remove her from all databases to make her ‘crime-free’. The device is with Bruce Wayne. She had been assured to be given the device by Phillip Stryver in return of Bruce Wayne’s fingerprints, to be used by John Daggett to make some failed stock market investments in the name of Bruce Wayne for Wayne Enterprises, resulting in the removal of Bruce Wayne from his own family’s company. But, regardless of that, Daggett does not get any advantage of his actions, since, Bruce had already asked Wayne Enterprises board member, Miranda Tate, to take over his company. Also, Selena had been double-crossed by Phillip and s he used a congressman’s phone she had in possession to inform the police. *Spoiler* for people who have not seen *The Dark Knight* Bane has captured Gordon, but Gordon escapes and meets John Blake and promotes him to detective. Bruce is forced to come back to his Batman avatar. Bane is able to create a nuclear bomb and announces that the detonator for it is in the possession of a civilian, which amazes Batman. What is set to happen next, is the plot of the film. Christopher Nolan has done a fantastic job when it comes to creating the perfect atmosphere around a figure like Batman. The surrounding attitudes and the track of mind has been displayed with brilliant effect. Nolan has taken care of every thing that there is to take care of. Be it the technical difficulties Batman faces initially, the emotions in people, when they have a chance to kill someone else to save themselves, is absolutely stunning. The way he has ended the trilogy is shocking, yet deeply satisfying. A marvelous (pun intended) job done by Nolan. There is no harm in saying that no one could have created a better background score for the entire trilogy than Hans Zimmer. His theme, entitled ‘Why Do We Fall?’ is the backbone of all thriller scenes in the movies. Slight altercations in it have been used to core perfection, to create a stunning trilogy. Very entertaining and engaging screenplay has been provided by Christopher Nolan. In ‘The Dark Knight’, there is not even a single moment unnecessary. Every clip played has its own importance in the epilogue. ‘Batman Begins’ starts of slightly haywire in the initial 20-30 minutes but picks up really well to approach a stunning climax. ‘The Dark Knight Rises’ although, has a lagging start to its screenplay, with too many new characters being introduced, none of them were being given a proper status. Bane’s introduction lacks any background to it, whatsoever. But, the screenplay picks up really well after Bruce is defeated by Bane initially. The scene where Bruce is in the well-shaped prison, especially his escape, has been scripted incredibly well. If I had to pick a movie with the best dialogues, it has to be the Dark Knight Trilogy, without any doubt. The Dark Knight trilogy is an example set in Hollywood which shows how dialogues can affect the entire aura of any film. The dialogues of each and every character, especially Bruce/Batman are too stunning, that you are actually astonished by them. Every dialogue has been so perfectly positioned that it really evokes emotion out of the audience. The dialogues themselves are so endearing and powerful and so very thought-provoking, that they are the most structural asset of any character’s personality, be it Bruce, Batman, Ra’s Al Ghoul, Harvey, Dent, Gordon, Bane, Selena, Miranda and especially the Joker. I would like to present to you some of my favorites. Bruce Wayne to Alfred: People need dramatic examples to shake them out of apathy and I can’t do that as Bruce Wayne. As a man, I’m flesh and blood, I can be ignored, I can be destroyed; but as a symbol… as a symbol I can be incorruptible, I can be everlasting. Alfred Pennyworth: Why bats, Master Wayne? Earle: Bruce? You’re supposed to be dead. Bruce Wayne: Sorry to disappoint. Batman, *SPOILER ALERT* repeating what he had been taught by Ra’s Al Ghoul again and again: [reverses his grip and pins Ra’s Al Ghoul to the floor] You never learned to mind your surroundings! The Scarecrow to Batman: Do you want my opinion? You need to lighten up. Alfred Pennyworth to Bruce Wayne: …Some men aren’t looking for anything logical, like money. They can’t be bought, bullied, reasoned, or negotiated with. Some men just want to watch the world burn. Gordon, to his son. : Because he’s (Batman) the hero Gotham deserves, but not the one it needs right now. So we’ll hunt him. Because he can take it. Because he’s not our hero. He’s a silent guardian. A watchful protector. A Dark Knight. The Joker, teaching Dent how to create chaos: Introduce a little anarchy. Upset the established order, and everything becomes chaos. I’m an agent of chaos. Oh, and you know the thing about chaos? It’s fair! The Joker to Det. Stephens: Do you want to know why I use a knife? Guns are too quick. You can’t savor all the… little emotions. In… you see, in their last moments, people show you who they really are. So in a way, I know your friends better than you ever did. Would you like to know which of them were cowards? Batman to Gordon: Because sometimes the truth isn’t good enough. Sometimes people deserve more. Batman to Gordon, repeating what Harvey said: You either die a hero or live long enough to see yourself become the villain. The Joker to Batman: This is what happens when an unstoppable force meets an immovable object. You truly are incorruptible, aren’t you? You won’t kill me out of some misplaced sense of self-righteousness. And I won’t kill you because you’re just too much fun. I think you and I are destined to do this forever … You need an ace in the hole. Mine’s Harvey … I took Gotham’s white knight and I brought him down to our level. It wasn’t hard. You see, madness, as you know, is like gravity. All it takes is a little push! Lucius Fox to Reese: Let me get this straight, you think that your client, one of the wealthiest and most powerful men in the world, is secretly a vigilante, who spends his nights beating criminals to a pulp with his bare hands, and your plan is to blackmail this person?…Good Luck. The Joker to Batman: Don’t talk like one of them, you’re not! Even if you’d like to be. To them, you’re just a freak, like me. They need you right now. But when they don’t, they’ll cast you out, like a leper. See, their morals, their code… it’s a bad joke. Dropped at the first sign of trouble. They’re only as good as the world allows them to be. I’ll show you, when the chips are down, these… these civilized people? They’ll eat each other. See, I’m not a monster, I’m just ahead of the curve. The Joker: If you are good at something, never do it for free. Batman to Gordon, making him remember what he had done for Bruce Wayne: A hero can be anyone. Even a man doing something as simple and reassuring as putting a coat around a young boy’s shoulders to let him know that the world hadn’t ended. Blind Prisoner: Then make the climb … As the child did. Without the rope. Then fear will find you again. Cat Woman: My mother warned me about getting into cars with strange men. John Blake: I just can’t take it. I mean, nobody will ever know who it was who saved an entire city. Lucius Fox to Batman: I like your new girlfriend! Cat Woman: [she undoes his cuffs] He should be so lucky. I wanted to add a lot more, but then, I assume you would enjoy listening to them the way they were intended to be heard. All the actors in the film have done an exceptionally good job. But some of them stand out from the others. 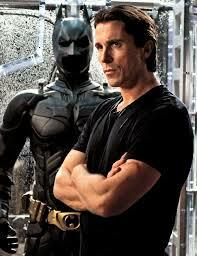 Christian Bale plays a good Bruce Wayne and a perfect Batman. He has the depth of voice and emotion to play someone like Bruce ‘Batman’ Wayne. He portrays the hardships faced by a man on whose shoulders lies the responsibility of the lives of 30 million socially, emotionally, economically and psychologically. Aaron Eckhart (Harvey Dent) *SPOILER ALERT* gives an emotionally striking yet horrifying performance for a person who has lost everything and anything that means to him. He has been shown from being the white knight of Gotham to its Dark Evil, in an absolutely stunning fashion. His face, personality and attitude towards others is in two fashions. He was a fan favorite, as well as the actual criminal behind what deeds were named after the Batman, hence truly signifying the name ‘Two-Face’. Gary Oldman (Gordon) has done his job pretty well. Morgan Freeman (Lucius Fox) is a delight to watch, with his funny sarcastic one-liners. Liam Neeson (Ra’s Al Ghoul) is shown as a person who understands human behavior and can use it against anyone. He has done his job amazingly well. Anne Hathaway (Cat Woman) has looked really good in the last installment. But one person who stands out from every other actor is Heath Ledger (The Joker). He performs with such eerie realism, that frightens the audience to an extent that it becomes stunning, yet blood-curdling. 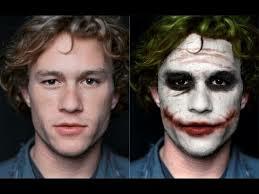 The mannerisms, voice-modulations and persona of Ledger is absolutely perfect for a character like ‘The Joker’. His dialogue delivery as well as his gestures are a fascinating but spine-chilling experience. He really is the backbone of this entire trilogy’s fame and success, in terms of acting ability. It is really hard to choose one best scene, especially when it comes to a trilogy so epic, like ‘The Dark Knight Trilogy’. But, as a critic, the very last scene of the trilogy is the best scene. It is the most tense, heavy, emotional yet deeply satisfying scene of the entire trilogy. It is the scene when Batman decides to take the nuclear bomb with his Bat Plane over to the bay to let it explode there and not affect anyone in the city. Cat Woman is told that there is not auto-pilot in the Bat Plane, meaning that he had to die with the bomb. At this scene, just when he is about to fly, he hints his identity to Gordon upon him asking it, since this was the last time they would meet. Gordon understands it was Bruce Wayne. John, with a bus full of orphaned children, sees Bat Plane exploding, realizing that no-one would ever know who the real Batman was. After Bruce’s death, of which only four people, namely Gordon, Lucius, Blake and Alfred knew, his will reveals his house being given to the government on the condition that it is used to house orphaned children of Gotham, so that no one has to face the hardships what he and John had to. The remaining was given to Alfred. While technically viewing the Bat Plane, it is revealed that the Bat Plane DID have the autopilot feature, done by the name of Bruce Wayne. John goes to check for anything Bruce left him. It is here revealed that his name is Robin, revealing his usage in the entire plot. He receives some directions in a package, which he follows. Alfred is seen in a restaurant where he sees, of which he already knows is alive, Bruce Wayne and Selena, alive. This shows that they had used the ‘clean-slate’ device on themselves. Thus, he satisfied himself and his dad, by dying protecting his city and he satisfied Alfred, by not giving him the burden to bury another member of the Wayne family. Gordon sees that the device he had used to signal Batman had been fixed, showing him that Batman/Bruce Wayne was still alive, somewhere. John sees himself reaching the Bat Cave via the directions. He continues the symbol of Batman, signifying that Batman is an immortal symbol. CRITIC’S CALL —> Not to be missed. A super-classic, Nolan style.